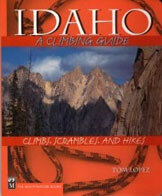 The highest point in Idaho south of the Snake River is found on this peak’s lofty and large summit. As a p2k summit it draws interest from out of state Peakbaggers. 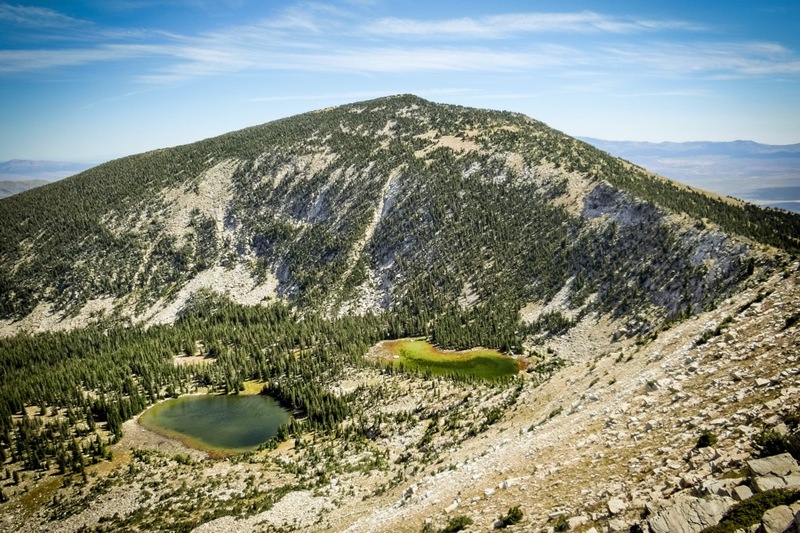 Given it’s height and prominence, Cache Peak is an enticing summit. I climbed the peak by traversing over from Mount Independence and descended down to the lakes in bowl below it’s northeast side. The peak can be and has been climbed in all seasons and from many directions. Cache Peak from Graham Peak. 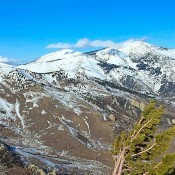 Cache Peak from Independence Peak. 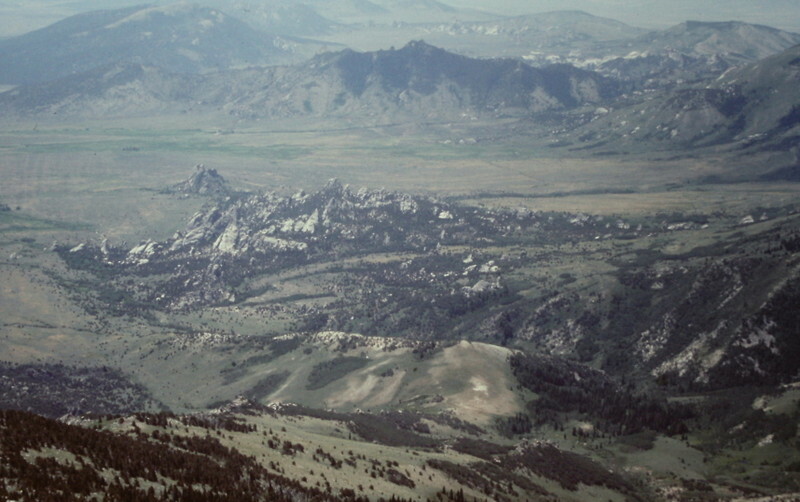 The City of Rocks viewed from the summit of Cache Peak. Same as for the Northeast Shoulder Route on Thunder Mountain. This route is part of a ridge traverse from Thunder Mountain to Cache Peak. From the 6,780-foot connecting saddle, follow a decent two-track jeep road westward along the R/N side of a cattle fence until the road ends about 300 vertical feet above the saddle. Continue to follow the R/N side of the cattle fence on a footpath through thick desert scrub. The footpath soon dies out. Bushwhack W up a steep scrub slope to reach the mountain mahogany-clad ridge crest of the Southeast Ridge. Once on the ridge crest, stay on its L/W side in open scrub rather than the thick mountain mahogany on the R/E side. Use ground boulders in the thick scrub to make better progress up the ridge. Skirt the L/S side of Point 8147, drop 30 vertical feet to a saddle, and continue to grind upward. Skirt the R/N side of a thick aspen patch at the W end of the saddle and then, after a short section of uphill, move leftward back onto the ridge crest and open terrain. From here, enjoy the fantastic views of the valley floor and the City of Rocks. Weave your way through the thick scrub (tedious). Large boulders soon emerge, making the task more laborious. At this point, the ridge crest is thick with trees/blowdown/boulders and is not a good option. Stay to the L/SW of the ridge crest. The final 1,000 vertical feet of ascent is PUNISHING. There is no more open terrain as the forest takes over. The trees/firs/boulders mix is exhausting. You will find a little relief just below the summit on a boulder-and-sand/gravel mix with the ability to avoid the thick firs. The summit of Cache Peak is a rocky outcrop with beautiful views. It has a nice cairn, summit registers in a large ammo box, and triangulation posts strewn about. There is no obvious USGS BM readily visible, but there is supposed to be a BM up here somewhere (unless it has been removed). The Southeast Ridge is a serious undertaking and is over two hours of hard work. Don’t take it lightly. The view from ID-77 makes this ridge look much easier than it actually is. Same as for the Southeast Ridge Route. 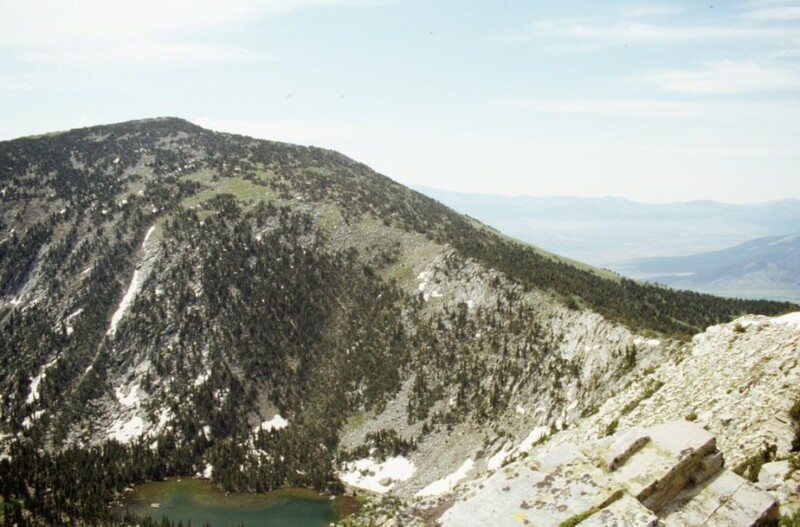 This route is part of a ridge traverse from Thunder Mountain to Cache Peak then a descent back down to Grape Creek Road and the Sawtooth National Forest boundary. 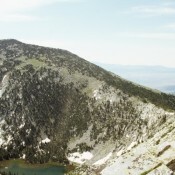 From the rocky summit of Cache Peak, descend N then NE down the rounded, ill-defined Northeast Ridge. After a short stint of open terrain near the summit (an easy mix of ground boulders and scattered trees), the ridge becomes an unpleasant mix of thick firs and boulders with almost no visibility. Stay far enough to the right so that you can see the sharp drop-off of the East Face of the peak to your R/E. There is a subtle false shoulder that wants to pull you left-ish/northward down to Green Creek. Don’t fall for it. Resist that temptation and trust your instruments to continue heading downhill in a NE (sometimes even ENE) direction. Eventually, the boulders abate and become scattered ground boulders (and eventually disappear entirely). As you descend, the forest becomes a burn zone of standing, blackened trees. Even the ground is blackened and scorched here. Thankfully, your visibility improves significantly in this burn zone and the bushwhacking isn’t bad. There isn’t much blowdown to contend with and the ground veg was scorched by the Grape Fire and is only beginning to come back. Aim for the open ridge saddle at 8,620 feet, using Point 8826 to guide you. The final section of terrain above the saddle is not charred and is thick forest on the ridge crest and on its N side. Stay in the open scrub and veg on the R/S side of the ridge crest and work your way through some pesky, scattered boulders that are in the mix. The open saddle has an old, dilapidated mining shack that you can visit, if you care to. From the saddle, your objective is to descend the east side of the Grape Creek drainage, which has open terrain (mostly field grass) and to avoid the aspen-clogged drainage itself (and on its west side). You want to descend to the upper reaches of Grape Creek Road, where it fades to a two-track jeep road and ends along the L/E side of Grape Creek at about 6,950 feet. How do you know all of this information? When you stood on the 6,780-foot saddle at the base of the Southeast Ridge of Cache Peak, you had a birds-eye view of the descent route and you did your last-minute recon. Smart move. From the 8,620-foot saddle on the Northeast Ridge, do a diagonal descending traverse SE then S to stay in open terrain (desert scrub) in order to reach more open terrain (field grass) on the eastern aspects of the Grape Creek drainage. High up, you will pass by some old, rusty mining machinery (including a rusty wheelbarrow) on the way. After descending about 1,200 vertical feet, you must cross a dry drainage to your L/E to reach the final slope/shoulder on the E side of the Grape Creek drainage. Stay just above the creek drainage and when you reach the 7,000-foot level, drop down to Grape Creek to intercept the Grape Creek Road (a faded two-track jeep road here) at its terminus on the E side of the creek. Follow the road SE then E then SE as it follows the Grape Creek drainage back to the Sawtooth National Forest boundary and your parking spot.